I should have been cleaning the bathrooms. Or meal planning. Or painting the rest of that room that is half done. Or trying to find out what exactly the mysterious odor is that lingers in my car….pretty sure the kids are to blame for that one. But, instead of doing all of those important and wonderfully productive jobs, I spent the better part of last week turning a bookcase into an American Girl Dollhouse. You see, I felt badly for my daughter’s Kit doll. She needed a home. She and her “accessories” were getting scattered hither and yon and I felt it would be in her best interest (and mine!) if she could have them (or at least some of them) all in one place. So, I built Kit her own Home Sweet Home. And now I’m a little bit jealous of her. I mean, she has hardwood (peel and stick) floors throughout, chair rails and even bead board (wallpaper) on the walls. Kit even has hardwood floors in her bedroom. Sheesh! Now, I’m totally jealous. My husband built her an attic using leftover scraps of wood and bead board. It’s screwed into the back of the bookcase with an ‘L’ bracket. 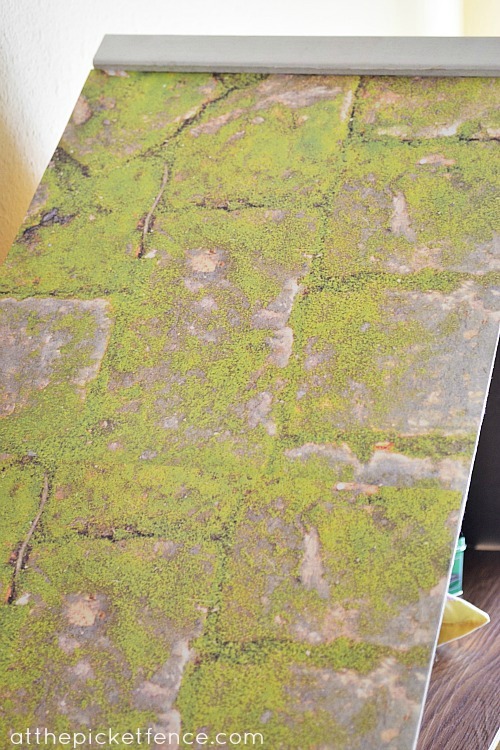 I decided that Kit would probably live in a house with a moss covered roof (scrapbook paper). I mean, she does come from the Depression Era so I’m guessing they didn’t have the resources needed for proper roof care. 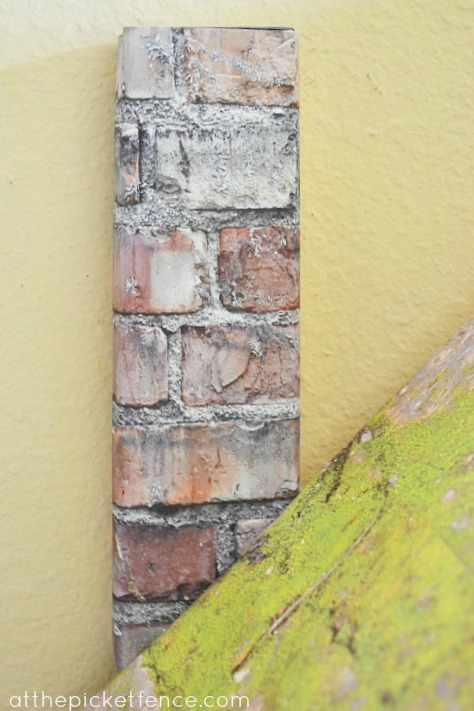 Now, my daughter took one look at that roof and said, “where’s the chimney?” I tried to tell her that Kit was so poor that they had to take the chimney apart and sell the bricks to pay their bills but she didn’t believe me for some reason. So, since “necessity is the mother of invention”, I got to work building a chimney. 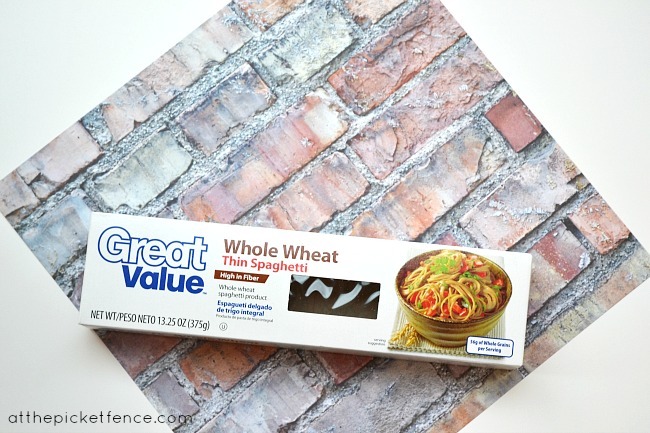 A piece of brick scrapbook paper and a spaghetti box did the trick! 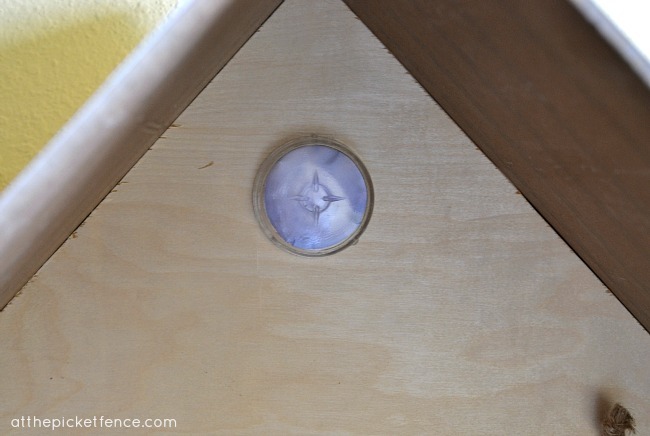 I was fairly certain that the attic needed a little round window but I wasn’t quite sure how to accomplish it. 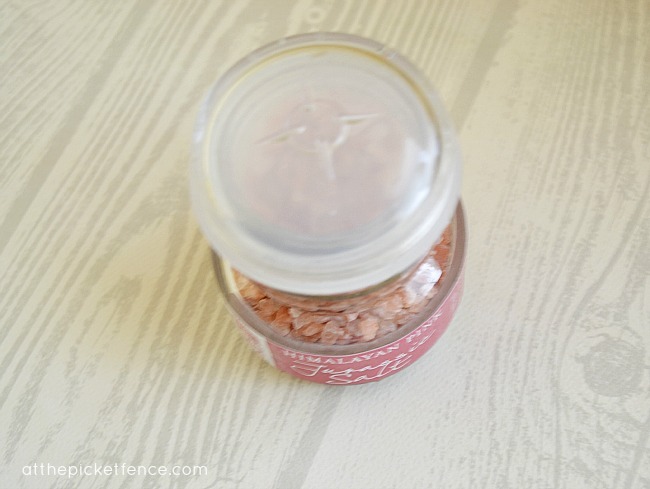 I scrounged around trying to find something that would work and remembered this jar of Pink Himalayan Salt that I picked up so I could copy my sister’s Chocolate Dipping Spoons. Who knew that pink salt could come in so handy? 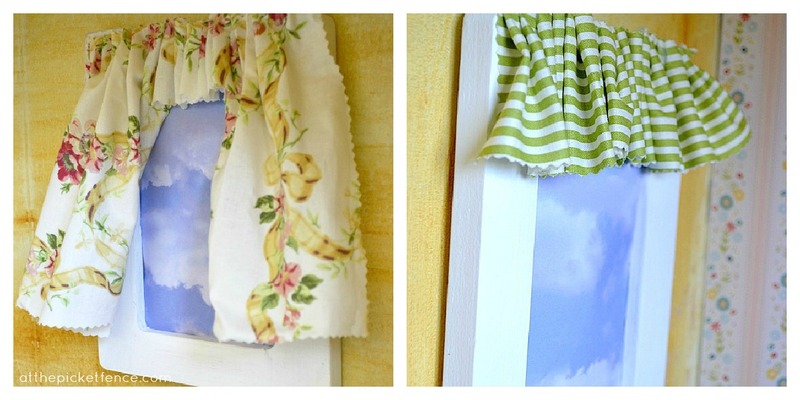 A piece of “sky” scrapbook paper and a dab (or two or three) of hot glue and Kit had herself an attic window. One more reason to be jealous of Kit. She always has blue skies at her house! We live in Oregon so this is completely unrealistic for us but we decided that since Kit was already having to deal with life during the Great Depression we could at least give her blue skies. With her scooter at the ready to take her on the next big adventure, Kit always knows that she has a place to call home. Oh wait! It looks like Kit has a friend visiting. That would be Molly. But, she’s not just any Molly. She is my Molly. The one I was given when I was a little girl. The one that was made by “Pleasant Company” before it was “American Girl”. She comes over to play at Kit’s house now and then and even though Kit always gets the cookie while Molly gets the vegetables (or nothing at all), they are still the best of friends! I still have the original box Molly came in and her books and accessories. I’ll never forget the Christmas when I received her. And when I saw all of the “extras” I was overjoyed! A little stocking, a package from Molly’s father who was fighting in the war and all sorts of other little bits and pieces. Many years later, I learned that while Molly and her Christmas dress were in the budget, her “extras” were not. My mother had lovingly and carefully replicated those accessories by studying the catalog and making them herself. The details were so perfect right down to the “stamp” on the package from Molly’s dad that I never even suspected that they weren’t the ones from the catalog. Today, those “extras” hold far more value in my heart than even Molly does. Each time I look at them I imagine my mom secretly working on them and how thrilled she must have been when she realized that I couldn’t tell the difference. 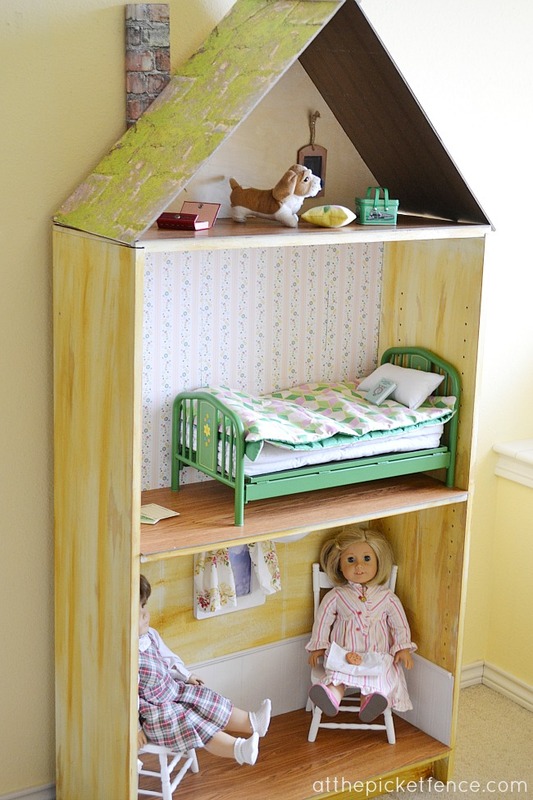 I hope my own daughter will someday look back on her childhood and remember her mommy turning a bookcase into a dollhouse. Just for fun. Just because. And I hope that she, like me, will feel all the love that went into creating something that fostered imagination and dreams. Thanks so much for joining me today at the Fence and be sure to come back on Friday when I reveal my daughter’s Vintage Inspired Bedroom! 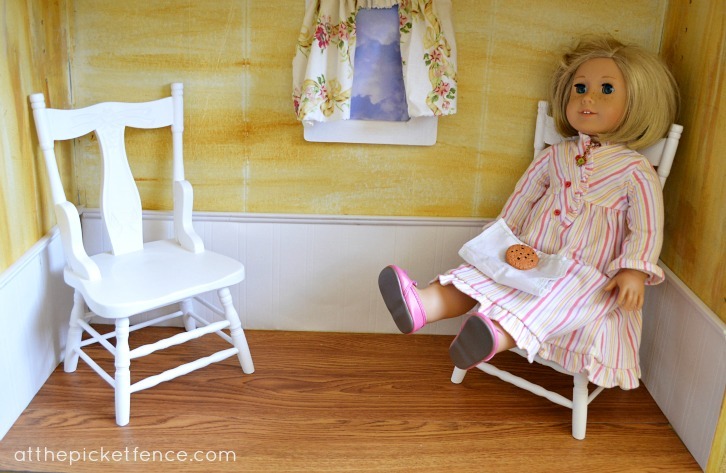 47 Comments on "American Girl Doll Sized Dollhouse"
Just adorable. It must have been a blast to make – much more fun than cooking and cleaning. Guess I will have to wait to make this for a grandchild since my daughter is grown. I imagine your daughter is just in heaven with this! WOW, such a fantastic doll house! Your daughter will forever remember how special this is! What fun memories she will have of playing with this. I imagine this will one day be placed in the attic, along with those precious dolls, to save for sharing with your granddaughter(s) one day. So special! What a beautiful doll house. I am jealous of Kit’s home as well! You did a fantastic job and I’m sure your daughter is thrilled. How special that you have a Molly doll. I didn’t even know they went back that far. That’s so cool. What a special gift you have given your daughter. OMG!! Would my grand daughter love this!! She has two American girl dolls. Oh Vanessa…what a fantastic doll house so lovingly built for your daughter…I remember when I was little, our Sunday School class built a doll house…I loved it so…and after it was completed, the teacher gave it to me…as I was the most excited about building that house…I shall never forget that..and your daughter will also have the fondest memories of her doll house…as you have with your doll. So cute!!! 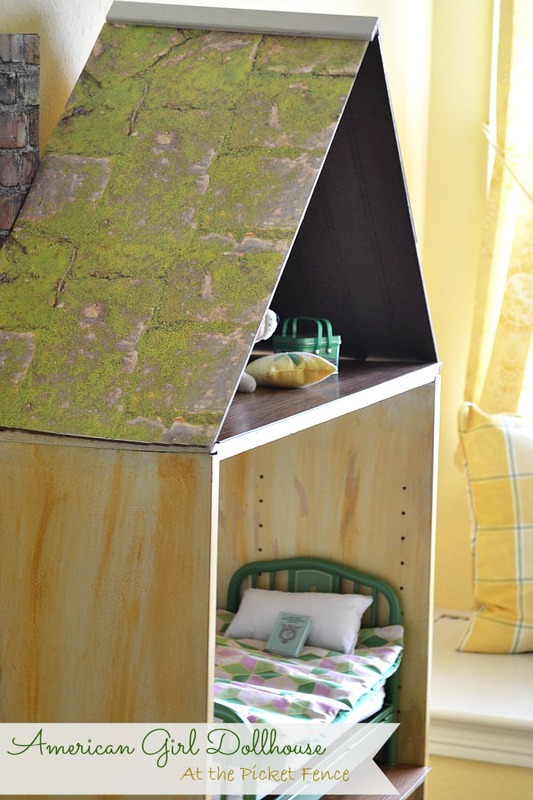 I will share this with my daughter.She has a American girl doll collection too.And yes we have Kit.What a cute doll house for Kit and Ruthie.Her attic looks just like Kit’s from the books too!Great idea to use scrap paper and pasta box for the chimney! Great job! Oh Vanessa, this is so sweet. Your daughter will appreciate the things you have done for her. No doubt about it. I too have many memories with my Mom for she loved dolls as much as my sisters and I. After we girls hit our “teen years” and our dolls were not as important to us, my Mom carefully put them away, only to give them back to us when we were grown. I love my doll more than ever. Wow! Great job, Vanessa! Time for an AG doll play date at Kit’s house! Oh my – what a wonderful idea! I loved reading your post and especially the pieces your mother lovingly made. What a treasure! I think I may give this a try for my two young nieces for their birthdays or Christmas next year! Thanks so much for sharing! That is so cute! I wish I would of thought of that when we had tons of little AGD pieces running around my house. My girls are too old to play with them anymore but each does have her little collection of dolls in her room on a high shelf. I think they like remembering the days when hours of play in the living room were spent with those darling dolls. That is beautiful! I know she will appreciate all the har work you put in to making that special place for her! I always wanted an American doll when I was a little girl. What a special thing your mom did for you! Vanessa, Your momma brought up a wonderful person and I am sure you are bringing up another wonderful person. Your project in building Kit her home is a treasure, chimney and all as was your mother’s project in constructing all of your treasures for Molly. You’ve done a wonderful job. Thank you for sharing your memories with us. Oh Vanessa, I have tears in my eyes at the sweet story of your own mother making the accessories for your doll Molly! 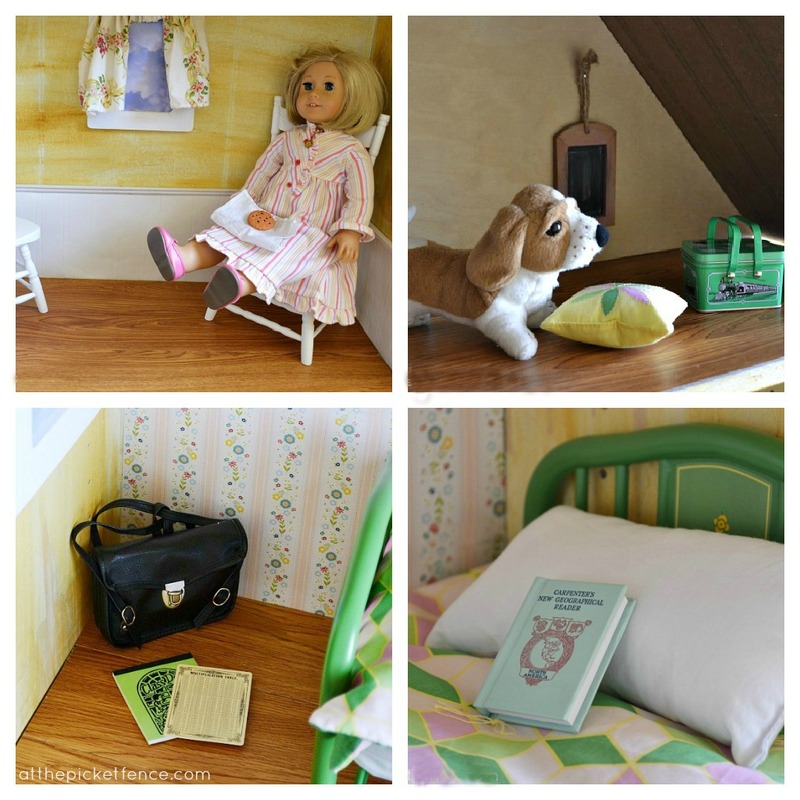 Here I thought I was merely reading an enjoyable post about the pretty dollhouse you and your husband put together for your daughter, and ended up in awe at how special it is that your own doll from your childhood can be a friend to your own daughter’s doll. Love! What a sweet and lovely story. You brought back some wonderful memories of things my mother made for me as a child. I love the dollhouse, you did such an excellent job. My granddaughter played with American Dolls and even had the same one as your daughter. She is 15 years old now and still has her doll but doesn’t play with her anymore. I guess she feels to grown-up. So sad… they grow up so fast, enjoy your little girl before she too puts her doll away. I am totally inspired! I have the perfect bookcase already, just had to see it thru your eyes… thanks for sharing. Cute, cute, Vanessa! 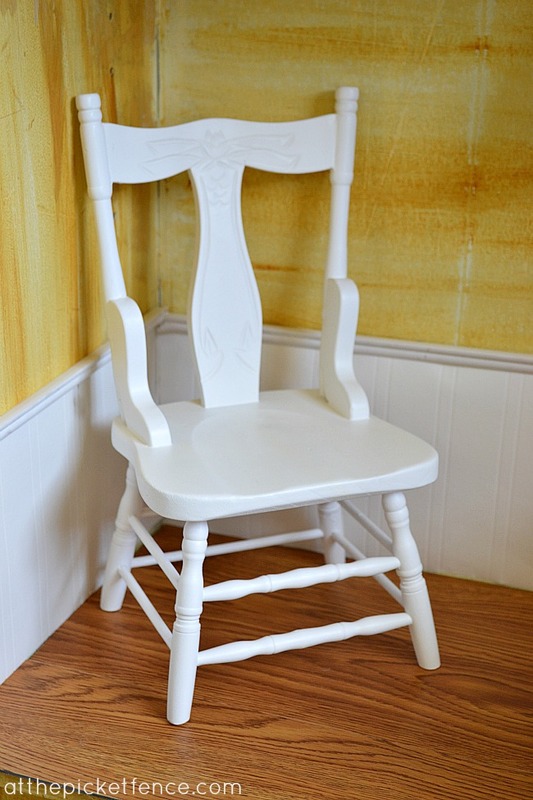 I made one for Kate using two Ikea tables…can’t wait to show her yours! That is so precious, Vanessa! 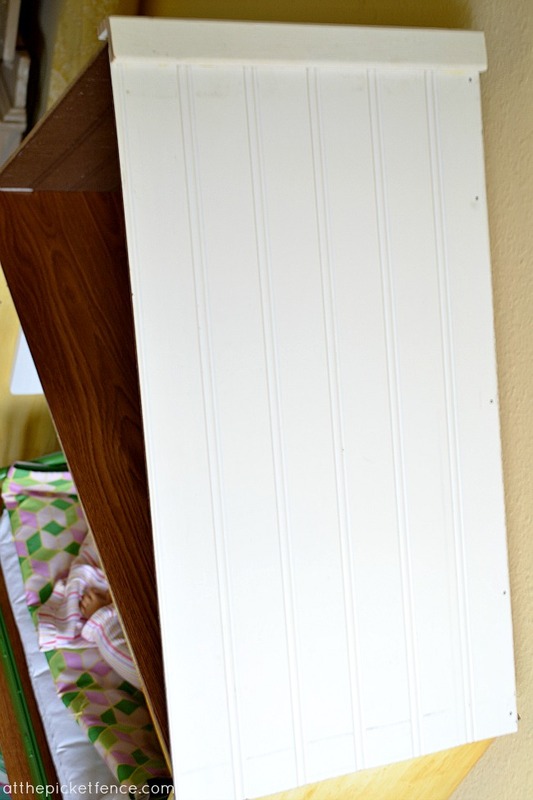 You definitely made the right choice in your priorities — painting that room or working on some other DIY project can be done any time, but your little girl won’t be a “little” girl indefinitely. Enjoy these precious young years — she WILL BECOME a TEENAGER way too soon! Your sweet baby girl is so lucky to have such a sweet and talented Mom like you, Vanessa! What an awesome new home that Kit now has! And, looks like she wasted no time in entertaining … wonder what Molly and she are chatting about. I love that you placed moss paper on the roof and, what a great chimney! I want a house like that! This is FANTASTIC!!! Our girls would totally love something like this. 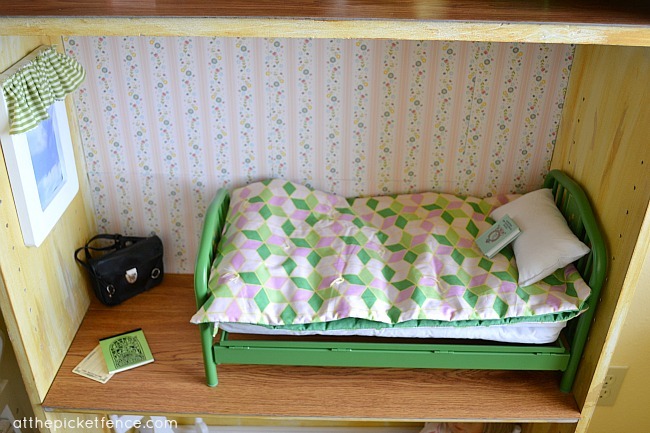 They have a Pottery Barn Dollhouse, but that is for their small wooden dolls. So this would be great for their American Girls dolls! Vanessa, You are such a good mom! 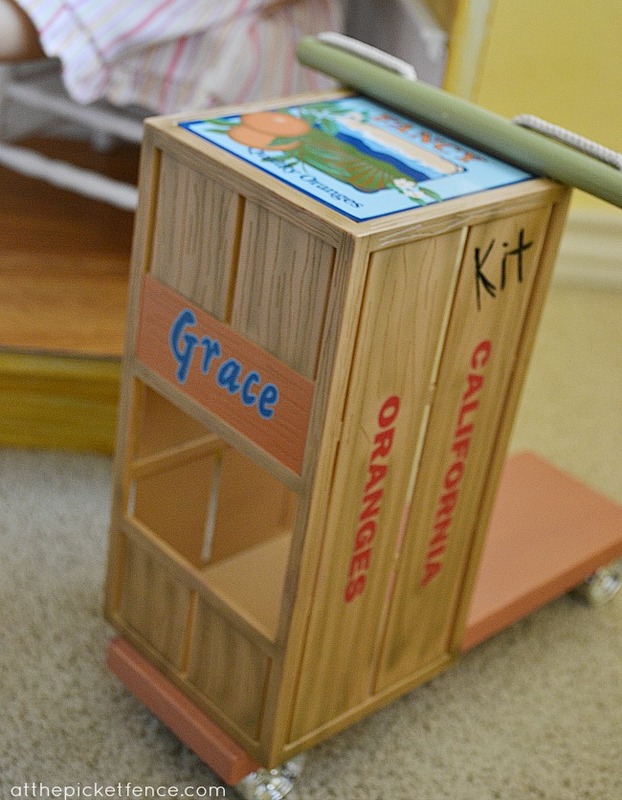 My granddaughter loves American Girl and she would be thrilled with the dollhouse. Oh, you little thing! This is adorable! Your little daughter is loving it, I’m sure! I read what you said someone said about your bookcase for books! You’re a hoot! I just love hoots! Cute bookshelf! I love the story about your own doll–very sweet of your mom! Now I just need a little girl… I have three boys. Maybe I should look for posts on legos and forts and things instead! Have a great day! And I just plain loved the story of your own doll and what your mom did. You have a treasure. Not only is the doll from the original company valuable, but the other stuff is priceless. You get two enthusiastic thumbs up from me for a wonderful way to spend your time. Go Mom! I LOVE this! It is so cute and you had me at the chimney. You are the academy award winning mom! 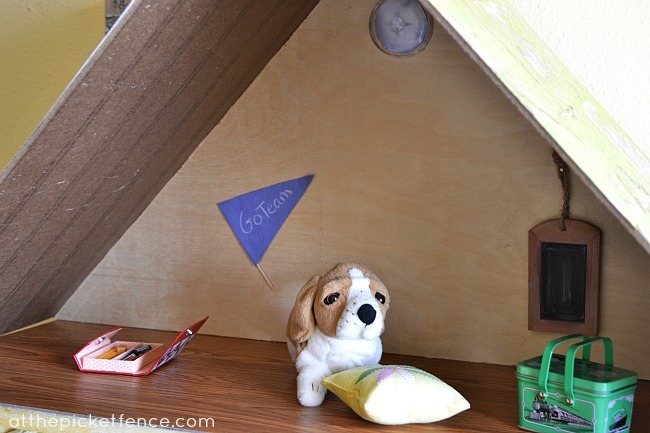 Vanessa, this is just the cutest most creative dollhouse! Kit must be so happy to have such a lovely hone with hardwood floors, and wallpaper, and an attic and a fireplace chimney! ADORABLE!!!! Kit sounds like a rascal…not sharing her cookie with Molly!-lol The spaghetti box is cracking me up. So clever-you are good girl. Valerie got her first AD for Christmas this year. Her 13 yr. old sister said, “No way will she like that!” Well…she still hasn’t given her a name yet, but there she lays in prime location next to Valerie every night. One of the best gifts ever-she loves her. I really need to do something like this. I can’t wait to show this post to Valerie tomorrow. She will be smiling ear to ear! LOL! Kit/my daughter is definitely a rascal Julie! I think the American Girl dolls are so wonderful and I love when I get to join in the play-time…even if Molly never does get the cookie. 😉 Thanks so much for your sweet words and for stopping by! Wow I love this, especially as it seems you have used items you just happened to have around the place. Fantastic!